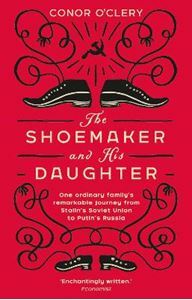 Quick overview The Shoemaker and His Daughter is an epic story spanning the Second World War to the fall of the Soviet Union, taking in eighty years of Soviet and Russian history, from Stalin to Putin. The Soviet Union, 1962. Gifted shoemaker Stanislav Suvorov is imprisoned for five years. His crime? Selling his car for a profit. On his release, social shame drives him and his family into voluntary exile in Siberia, 5,000 kilometres from home. In a climate that's unfriendly both geographically and politically, it's their chance to start again. The Shoemaker and His Daughter is an epic story spanning the Second World War to the fall of the Soviet Union, taking in eighty years of Soviet and Russian history, from Stalin to Putin. Following the footsteps of a remarkable family Conor O'Clery knows well - he is married to the shoemaker's daughter - it's both a compelling insight into life in a secretive world at a siesmic moment in time and a powerful tale of ordinary lives shaped by extraordinary times.